If you're on the prowl for summery electronic music, here's a good one for you. 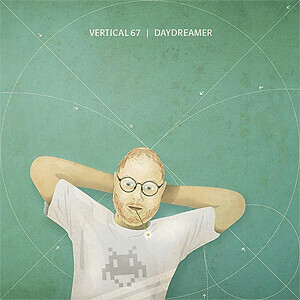 Vertical67's "Daydreamer" EP out recently via Schwa! Records is a breath of fresh air, and as the cover art suggests, could very well be the perfect audio companion to any activity on a warm summer afternoon, such as relaxing in the shade or cycling through the city. Here Vertical67 blends dreamy IDM with upbeat acid house, achieving a nice balance of energy and feel-good melody. Opener "Awaiting This Moment" gets things started with a laid-back bpm and a classic house dance feel that is sure to get your toe tapping. Around the 2:06 mark is the moment I was waiting for with enthusiastic bursts of sprinting synth piano rolls backed by a solid 4-on-the-floor and a warm, underlying trance pad. Stand-out track "Sunday Afternoon Jam" is a creative melodic piece comprised of bubbly bass, syncopated rhythms, and a peculiarly cute synth lead that reminds me a bit of Global Goon's "Vatican Nitez". The atmospheric reverb in this track is a lush wonderland where the haze of yellow incense and purple bumble bees swirl around your head as you sink deeper into a bed of fluffy green grass. I enjoy the way Vertical67 applies his psychedelic influence without being too obvious about it. "Cosmic Falafel" incorporates subtle tongue clicks and some textural microsounds you can almost feel in the back of your sinuses whilst headphone listening, and "Moondance" gives us an acid bassline that occasionally flutters up into 8-bit-ish bleeps. The entire release is sprinkled with abstract samples and brainy changeups, but still maintains a steady dance floor feel, rounding out nicely with a solid remix from Volitune. Information found on the Schwa! Records site says this EP "features mostly tracks comin out of jamsessions with hardwaresynths and TR-606 and some other bits created under the influence of chocolate cookies, sunshine and other nice things" which, I have to admit, makes me love it even more.